Middle East Forum director Gregg Roman appeared on Al-Jazeera America on October 13 to discuss the recent wave of Palestinian stabbing attacks against Israelis. See video at right. Is your sense that the violence is random, not organized? I think that it's not just the violence that we have to focus on, but [also] what I would call the serialization of terrorism. Essentially these individuals have taken viral incitement that has been broadcast from the Palestinian territories, whether it be Gaza or the West Bank. It's effectively the export of ISIS-brand terrorism that's now affecting innocent Israelis, west and east of the Green Line. Now, this evening the government reportedly announced that it will seal off some Arab neighborhoods in East Jerusalem in order to try and prevent some of these attacks. Is there not the danger that taking that kind of action will inflame things further? I think that the situation has already boiled [beyond] where it's supposed to go. ... This isn't crisis resolution mode for the Israeli government right now. This is about crisis management. Until there is an acceptable Palestinian leadership that's willing to sit at the table with Israel, condemn this terror wave, and basically manage their own people, there's only going to be harsher Israeli security measures. And the result of that might be tepid for the Israeli populace, but at the same time we have to realize that there's not many other options that they have. On the leadership levels, there are many issues on both sides. Beyond the ugliness of the attacks themselves, we're seeing Israelis egging on security forces to kill attackers after they've been restrained. But, on the other hand, we've seen Palestinian leaders, including [Palestinian Authority President] Mahmoud Abbas, turning attackers into martyrs. Reactions like those on both sides have got to worry you if you're hoping for a solution. 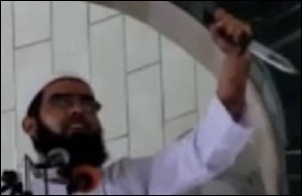 Gaza cleric Muhammad Sallah calls on Palestinians to carry out stabbing attacks against Jews on October 9. You see the Israeli government trying to stop conflict and trying to mitigate conflict, while at the same time you see the Palestinian leadership trying to egg it on. But on the other hand, you have some fairly impartial observers. Terje Roed-Larsen, who is one of the architects of the Oslo Accords, argues that Israel needs to stop building settlements in the West Bank if we're going to see an improvement in the region. And also Palestinians are saying that they're fed up because they don't see the peace process going anywhere. Do they not have a point? I think that these young Palestinians do have a point. But the root of the problem is that the Oslo Accords that the Norwegians tried to pen together 23 years ago have effectively become a failed agreement. There needs to be a new paradigm for peace within the framework of Palestinians working with Israelis. I think the Israelis have demonstrated they've been ready to make peace 18 or 19 times. But ... in the wake of all these attacks—7 dead Israelis and 93 more injured later—there's only going to be increased security concerns and a destabilized security situation.